This fine example of the Watson-Will Fig Tree Pocket Twin is the work of Don Brymer (Australia). The engine is as yet un-run due to Don's concern with the one-piece 4130 crank. 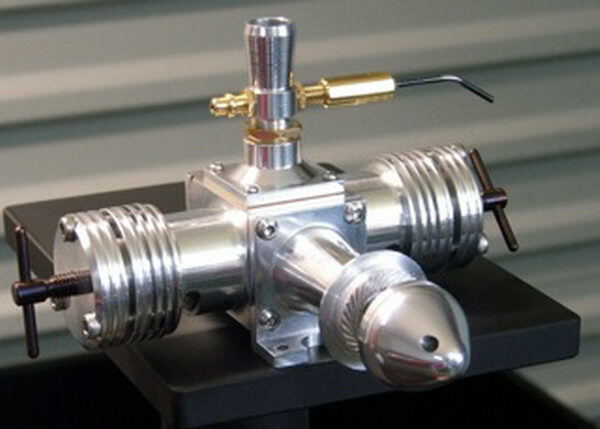 A fabricated crank using hardened drill rod for the conrod journals. With a suitable jig for assembly, this sort of construction is an excellent idea for amateurs having no facilities for hardening, tempering, and subsequent grinding. When I first drew up the plans for the FTP Twin from Russ' original sketches, we both thought that perhaps somebody might build one, someday, perhaps. The actual number have quite surprised me and would have delighted Russ. The basic cylinder and porting is a direct copy of the MVVS diesel, while the case is based on the ETW Craftsman Twin, and the conrod big end design is based ont ETW's Ladybird in-line twin diesel. Russ was adamant that he he was not the designer because apart from the carby, everything else on the engine had originated elsewhere. 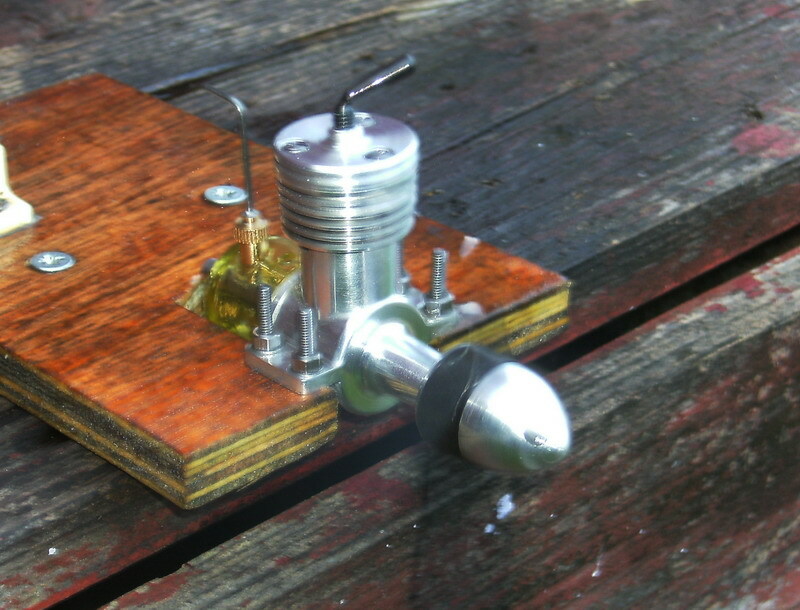 This Replica ED Mk1 Bee was built by Jim Frew, Dorset, UK. The crankcase was hogged from solid, using a method similar to that I described for the Mills 1.3 (Jim has one of these on the way too). Jim's replica replaces his worn out original—he figured that making a new one would not take much longer than doing a rebore, new piston, contra, etc. There are a few internal changes for the better. The con-rod is HE15 aluminium instead of steel (hard on hard is never a good idea). 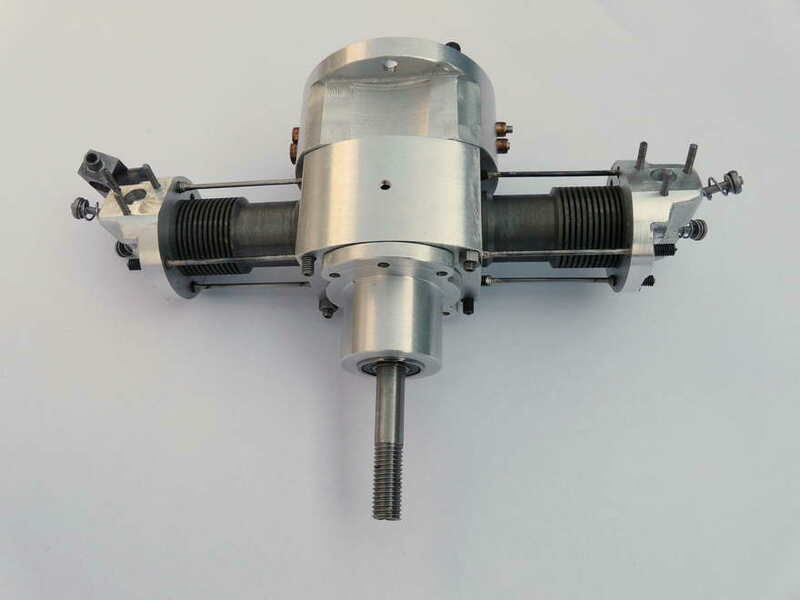 The crank web is the similar to the Mk2 which has a thicker section and it has a David Owen Contra. The tanks uses Bert Streigler's screwdriver handle trick. Jim wanted green, but seems green screwdrivers are as rare as hens teeth these days, so yellow it is. 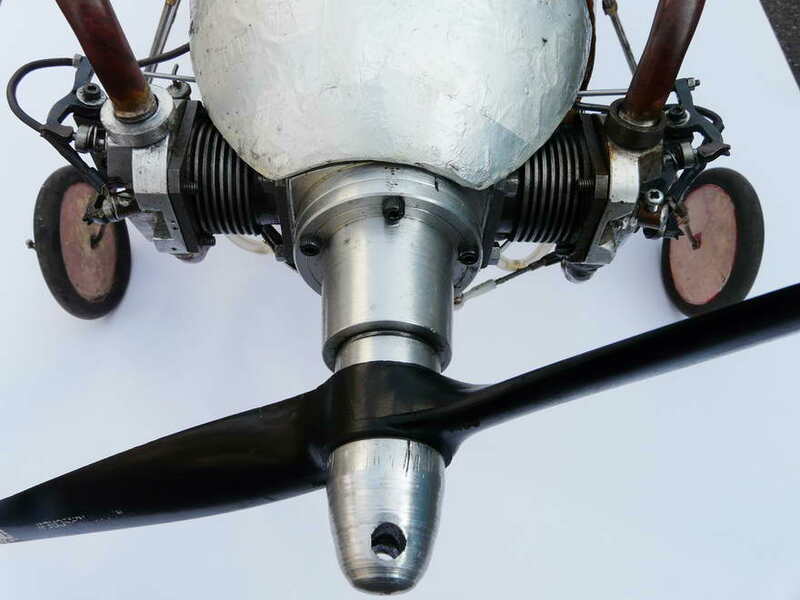 The hard part, says Jim, was machining the inside of the prop nut where he found it difficult to avoid the chatter. The assembled replica Bee felt and looked like the new one Jim had bought 55 years ago. First the runs were a bit erratic until the right needle was found, but now it is freeing up nicely. The old Bee also got the rebore and a bronze crankshaft bush. 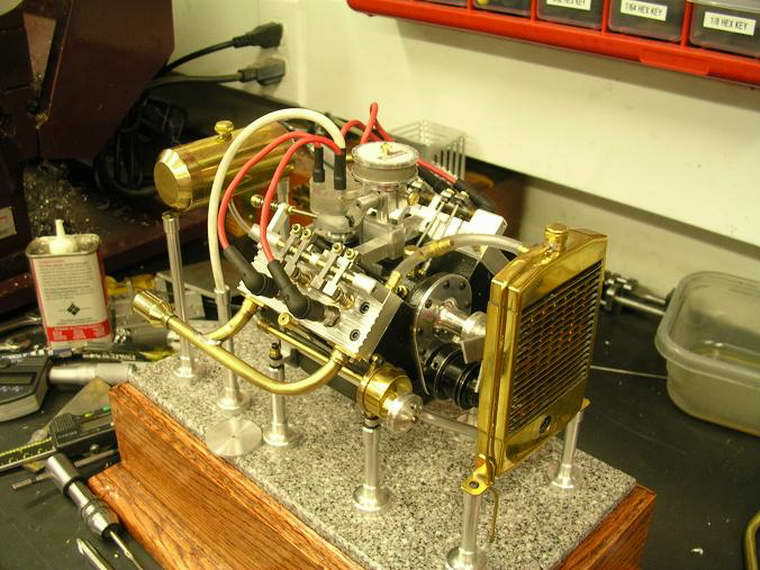 This 18 cylinder, 180cc radial glow engine is the work of Lars Wigren, Sewden. 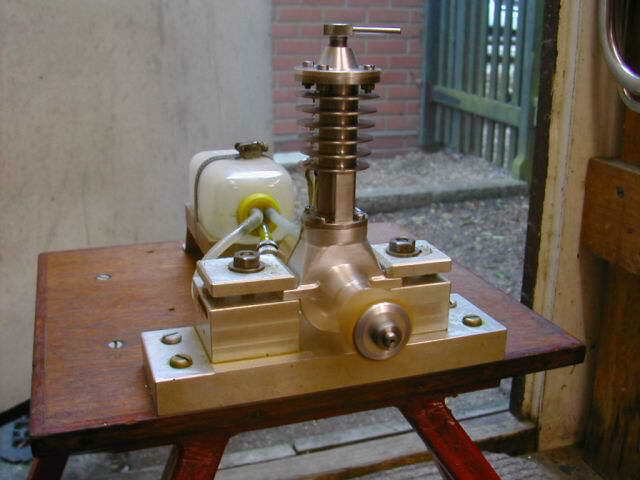 Lars writes that it is really two nine cylinder engines mounted back to back with a couple of flanges and a short intermediate shaft to connect the two crankshafts. It has a 50mm car turbo compressor wheel running at engine speed to help with fuel distribution and an angled starter coupling at the rear. The cylinder heads in the rear row are turned thru 180§ to have the ports to the rear, with extra brackets to support the rocker shafts. 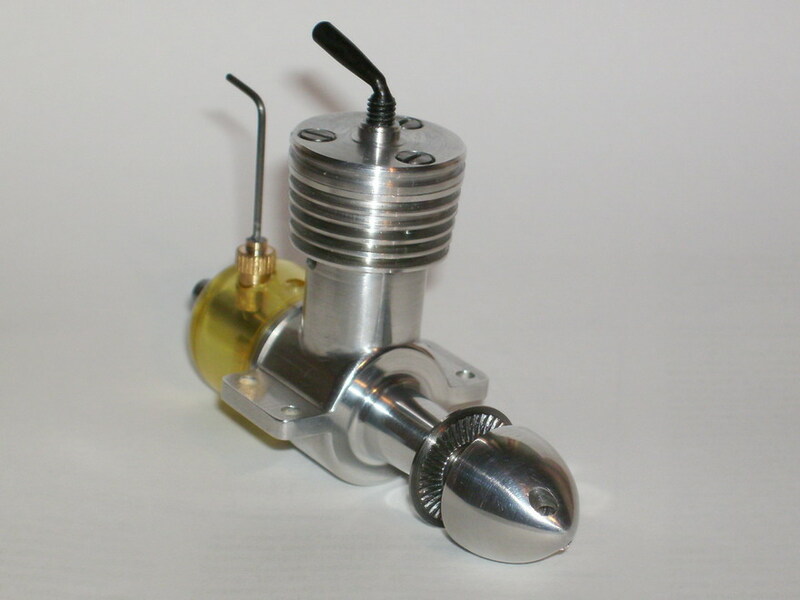 The engine is based on the seven cylinder 70cc radial engine designed by Robert Standar, Germany in 1990 (www.standar-engines.de). 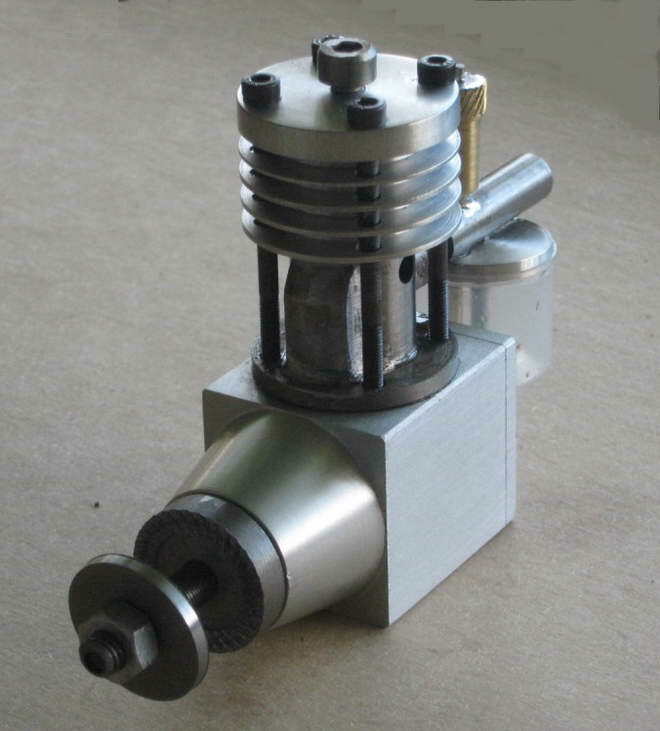 This design is public (German FMT journal) from which "someone" made a nine cylinder version. 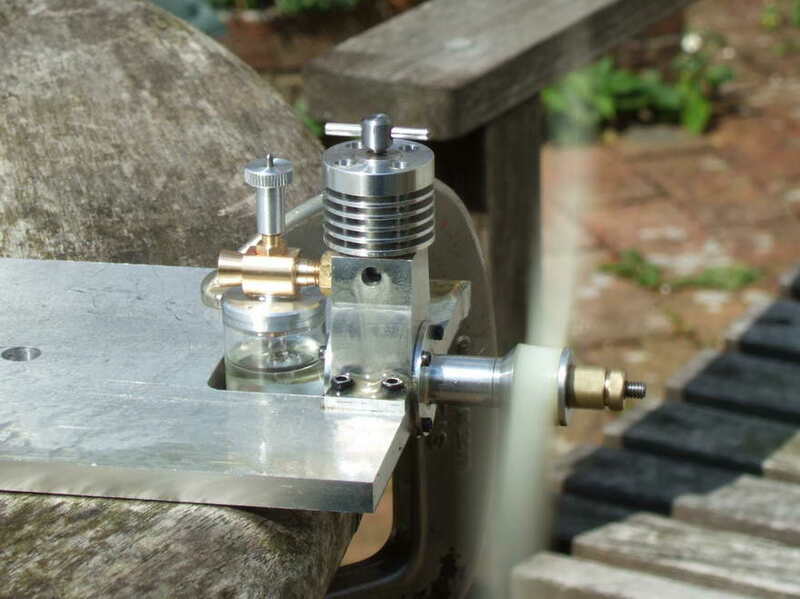 Lars bought one half-finished engine from German eBay, then later a set of prefabricated parts to build another. He says that he cheated a bit so cylinder liners and piston rings are from Webra T4-60 (same as used in Standar-Engines Silver Star 108cc 9-cylinder), cam discs, valvs and rockers from the Silver Star. But everything to the rear of the rear cylinder row was designed and made him, including all that amazing pipework. I’m thinking of building an exhaust collector ring so I have not cut the exhaust pipes to length yet. The Weaver was a Joy to build. The drawings were perfect. The only areas that were a bit challenging for me were as follows. The other area that was a learning experience was the soldering of the inlet fitting. After some experimenting I found that using flux with solder in it worked well. You just dab it on were you want the solder and then heat the whole assembly up until it flows. I had no other problems and I really love the design. Starting was no problem. while holding the engine in my hand I could make it fire on a prime through the exhaust ports. 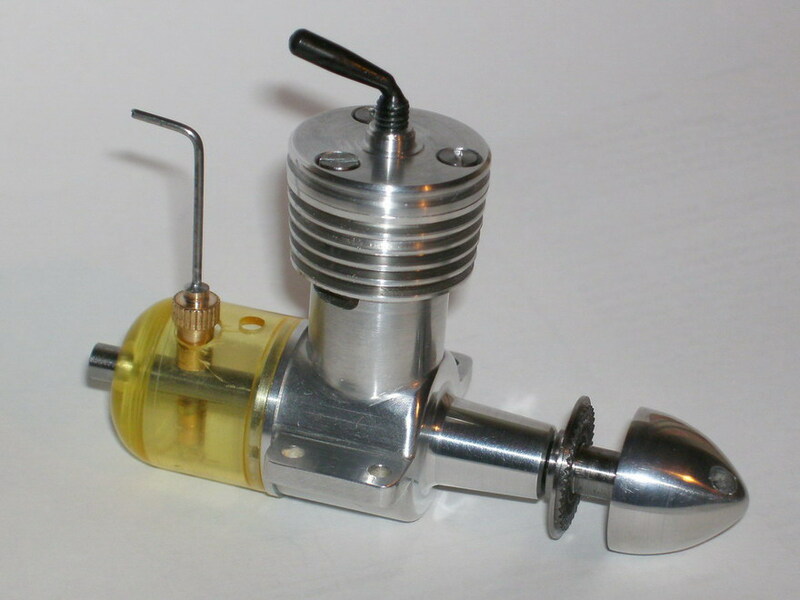 I then mounted the engine on a test stand, filled the tank, opened the needle about 1 1/2 turns, choked it one flip. The engine started on the fourth flip. 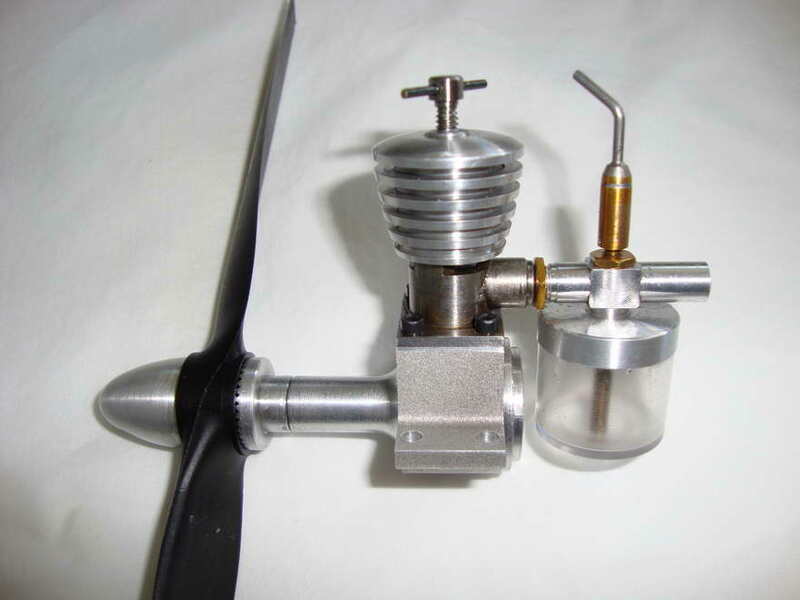 I leaned it out a bit and adjusted the compression for a steady run and measured the rpm at 6800 on a 8x4 prop. Now that it is broken in and adjusted, it will start with just a few flips. I could not be happier with this engine. Thanks for your contribution to this great hobby. 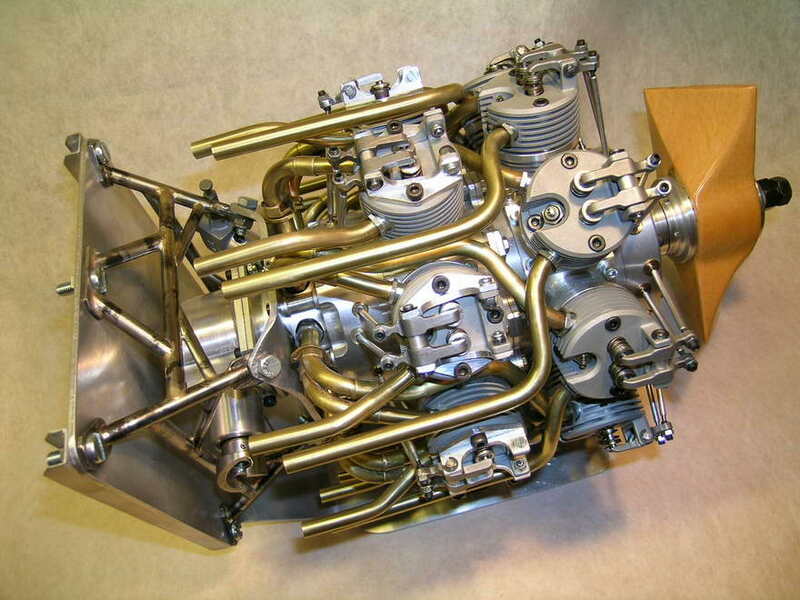 These flat twin four-strokes are the work of Chris Turner (UK, and a rather appropriate surname!). 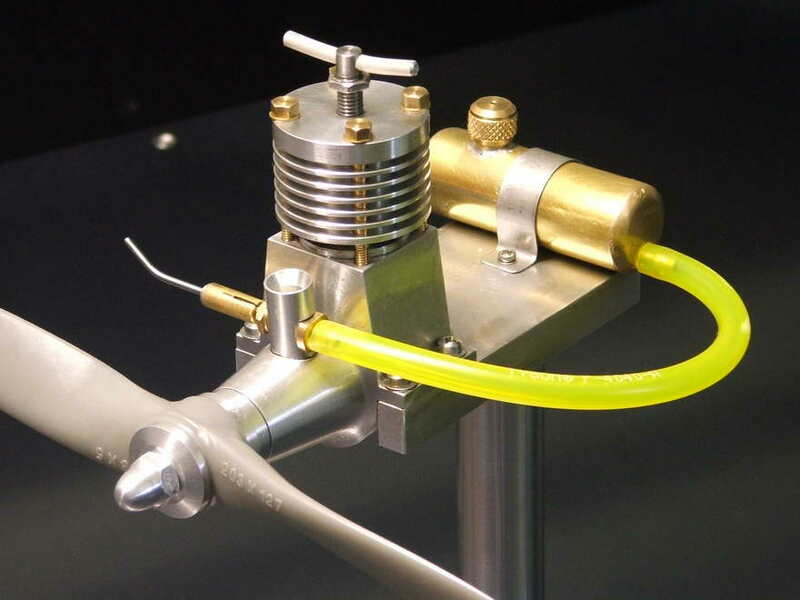 The one in the aircraft has bore of 0.88" with a stroke of 0.92" for a displacement of 0.90 cuin. The compression ratio is set at 7.8:1 and it weighs about 1kg (2.2 lb). The other, as yet unfinished, is a proof of design for a five cylinder radial Chris is planning. 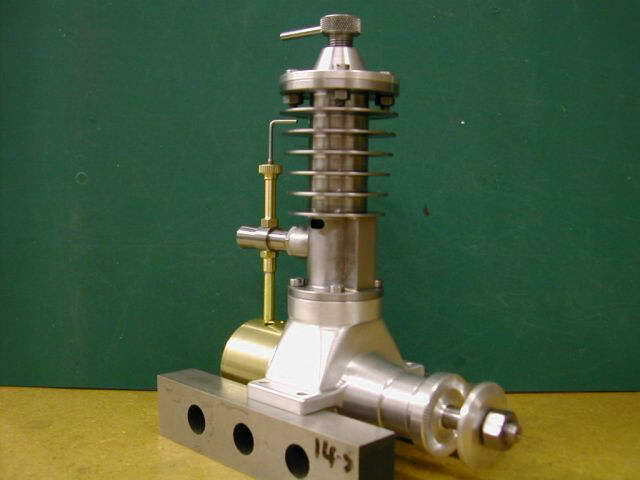 It has a bore/stroke of 0.70/0.75" giving a displacement of 0.57 cuin. Both have separate gear boxes, cast iron cylinders, ringed pistons, and inclined valves which Chris finds results in a better combustion chamber. He says that the hardest part is making the split valve collets and he makes at least twice as many as needed so he can file away half of each to produce one collet and allow for the ones which escape between the shed floorboards during the process. Gallery pages get assembled in reverse order, so newer pictures are at the top. Down below, you find a shot of a crankcase hogged from a solid block for a replica of the ED Racer, enlarged to 5cc displacement by Ramon "Tug" Wilson (UK). Tug like to build in pairs and I know for a fact that you can make two in not much more time than it takes to make one—most of the effort going into the setup, not the machining. Click on the thumbnail picture to be taken to a separate page showing more of these magnificant creations. Ramon conducted quite a few experiments into dye agents before tackling the cylinder fins for his 5cc Racers. He reports that the deep blue was produced from green Parker writing ink. I really admire people who conduct trials like this. 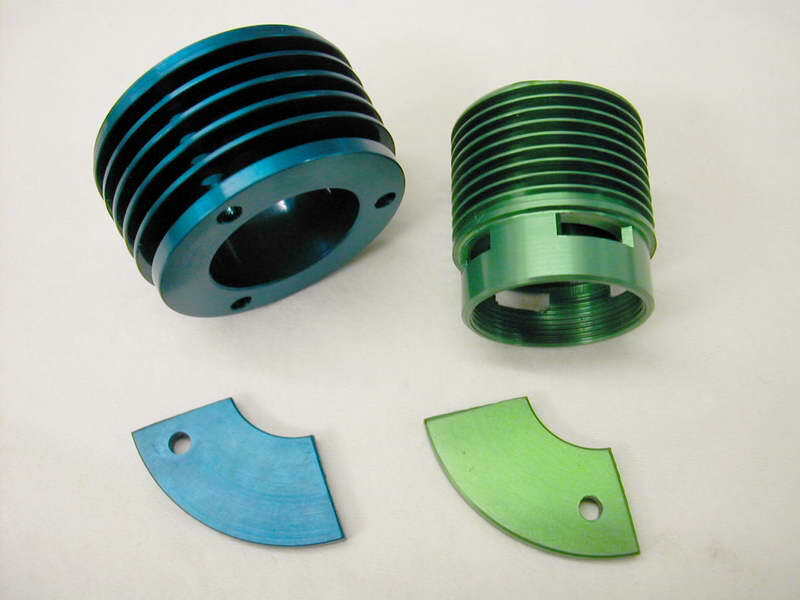 Anodizing is simple, but time consuming, and to go through all that just to find your lates color treatment didn't work as planned can be frustrating. I eventually just gave up and ordered an anodizing kit that solved all my color problems, but don't let that stop you from trying other ways—I'm surprised you can still get Parker ink! 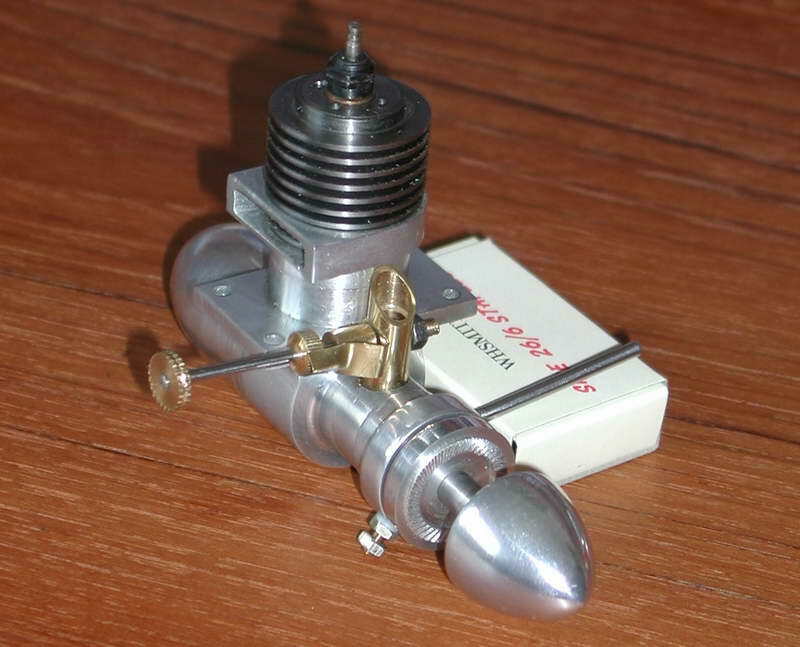 This is the 0.5cc Richard Gordon designed, Alpha, as executed by John Beddard (UK). The engine appeared as a supplement in issue 4047 of the Model Engineer of 18-31 October, 1996. The article accompanying the plans goes into considerable detail of the design process as well as the actual construction. To simplify construction Richard designed the main crankcase to be sawn from 5/8" thick plate with the front bearing glued in with Araldite, a feature employed on the earlier 0.75cc PMC-IMP (a MEN Members' free plan). 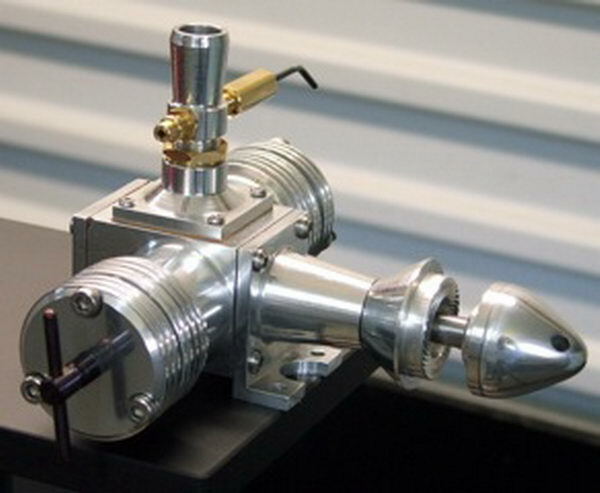 This can work, though this joint is highly stressed, especially in a diesel, and at 0.5cc (0.03 cuin) displacement, there is not a lot of surface area available to distribute the shock. Wisely, John opted to use small Allen head screws to retain the part. As seen here, John's Alpha runs well, once he increased the size of the fuel feed pipe to cure a case of premature starvation. John says he has not run a "diesel" since he was 10 years old and I'll bet the thrill of running an engine he has built from scratch is just as grat today as coaxing one into life was way back then. This engine has a delightfully mixed ancestory. 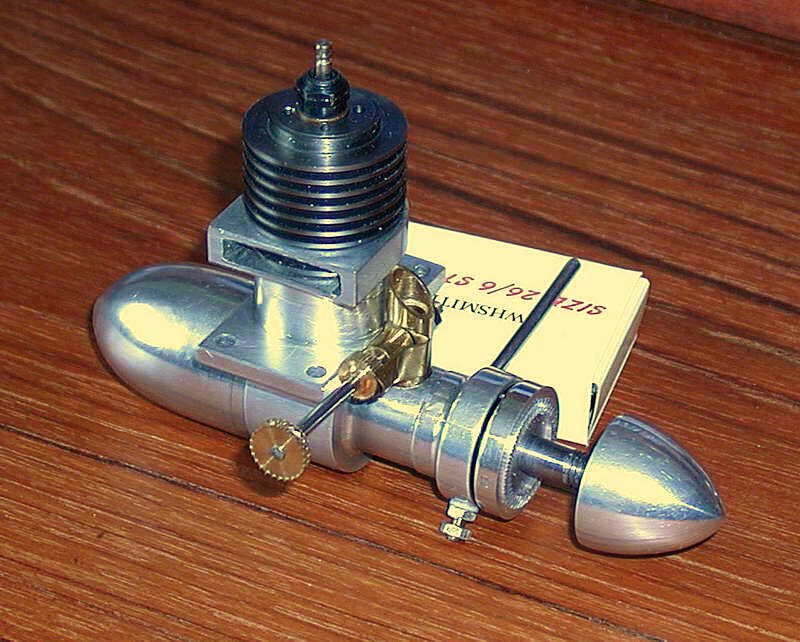 The design is a TOP 20, a Japanese ignition engine from the the 1940's. Few survive, although a pristine one was found in a flea-market in Australia (yes, it does happen—just not to me). This was reported in the British magazine, Model Engine World #56, December 1998 in an article in which MEW editor, John Goodall, says some rather unkind things about the Motor Boys which he knew to be untrue. Well, that aside, plans for the TOP 20 were drawn up by John Maddaford, with a two part build series, sans plans, appearing in MEW issues #65 and 66. 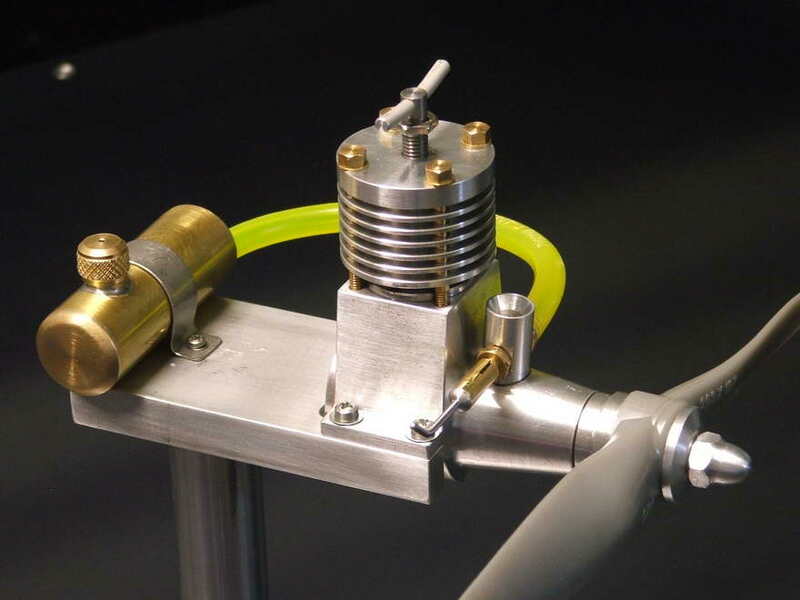 The example seen here was built by Mike Atkinson (UK). The TOP 20 makes an excellent subject as no castings are required for a faithful reproduction, and apart from the need to be able to cut threads and the piston valve transfer similar to the M&M, building one should present no major difficulties to a model engineer who has not ventured into IC before, but has some experience in another area such as steam, or workshop tools. 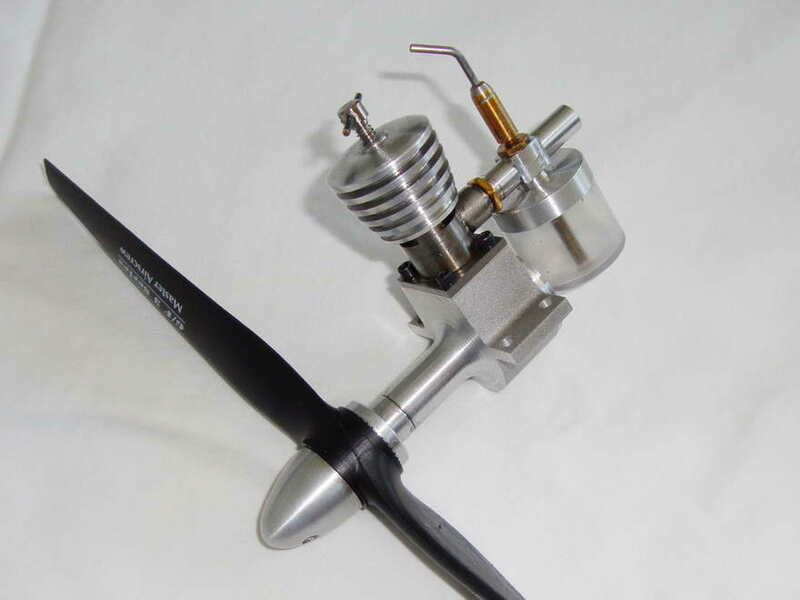 As spark ignition engines run at rather low compression ratios (see the FAQ for further information), they are more tollerant of piston to cylinder fit, giving the first-time builder a bit of a margin as they learn the craft. Back to the subject, the TOP makes a good looking and good running engine and Mike is to be congratulated on the execution of his example. Here's some more work by Ramon Wilson whose NOVA appears below. This time it's a pair of crankcases for a scaled up ED Racer. The finished engine will be around 5cc making it sort of like a Miles Special—appropriate seeing as Basil Miles designed the ED racer in the first place. 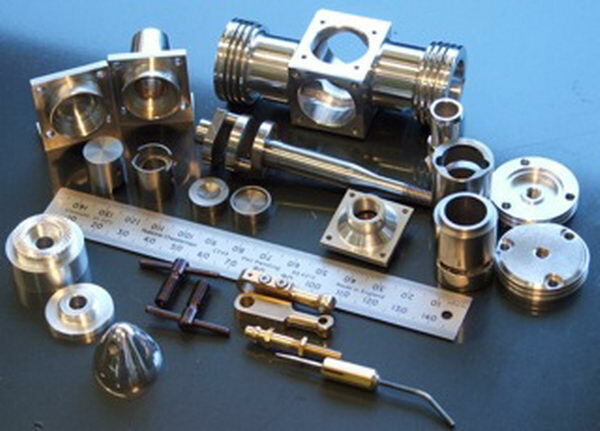 They may look like fine examples of CNC production, but in this case, Ramon and the mill handwheels provided the "CN" and his experience and skill the final "C". You can view a photo set of how this was done on Picassa. 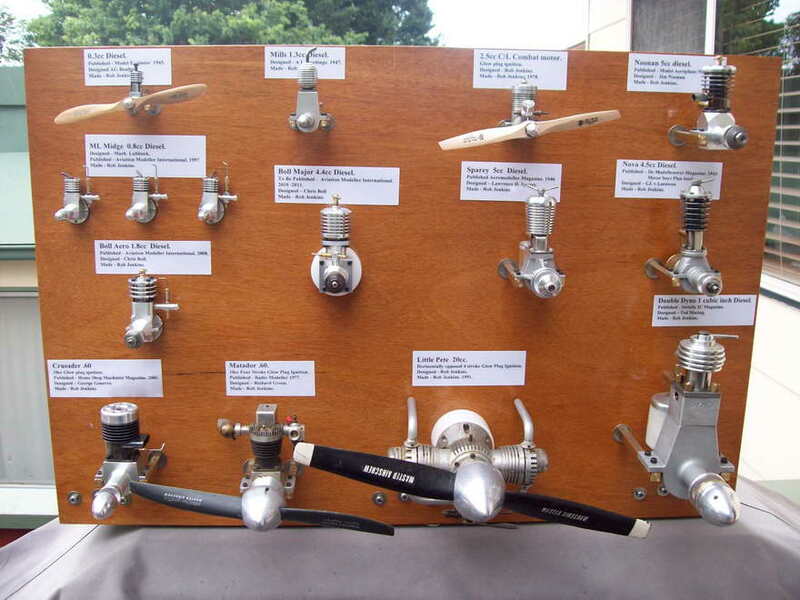 This display board of shop built model engines was put together by Rob Jenkins (Australia) at the request of his model engineering club for an open display day. Rob says that not one person took any interest, prefering working steam and hot air engines. I've had the same experience and declared that next time, I show less, but run them at regular intervals and see if the noise attracts the punters. Regardless, Rob's board is a nice display. How many can you identify? This Nova 1 was made by Ramon Wilson from magazine published plans. Although it is hard to spot, Ramon hogged the crankase from a solid lump of aluminium. 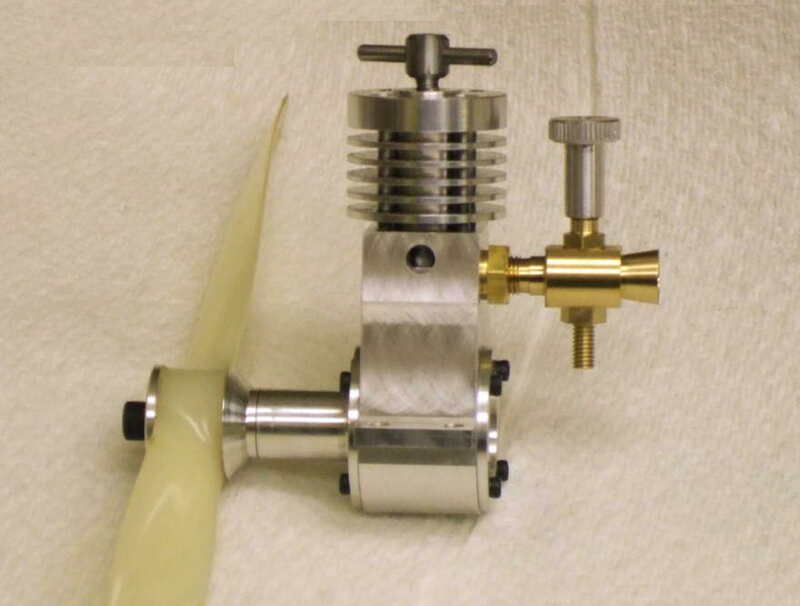 Other changes include a fabricated crankshaft and cooling fins that taper slightly from root to tip. Not only is this "correct" per full-size practice to correctly conduct heat over the whole fin surface area, it also helps prevent the fins, which are only 0.5mm thick, from warping during turning from normal cutting friction. Ramon reports the engine started up almost immediatly and run well. He's no looking for the next IC project to tackle. This Bob Shores designed PeeWee V4 was completed and test run for the first time in 2010. 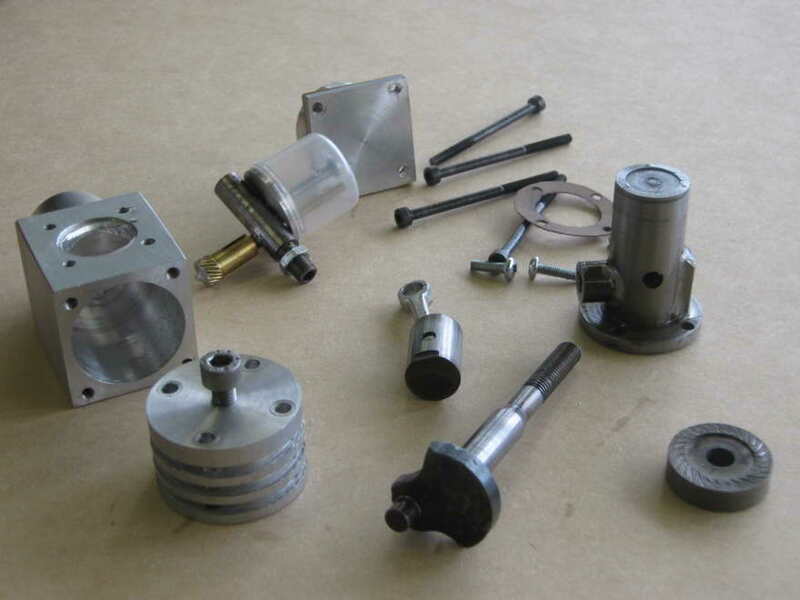 It is the work of a justly proud Steve Huck (USA) who kindly provided a detailed description of his approach to making a camshaft by offset turning as used on the project. Steve says thet after doing the happy dance and things settled down he got to thinking that the camshaft theory and methods are sound and is now positive that a novice with just a lathe can make a camshaft that will run an engine. Steve has placed a video of the engine running on Youtube. 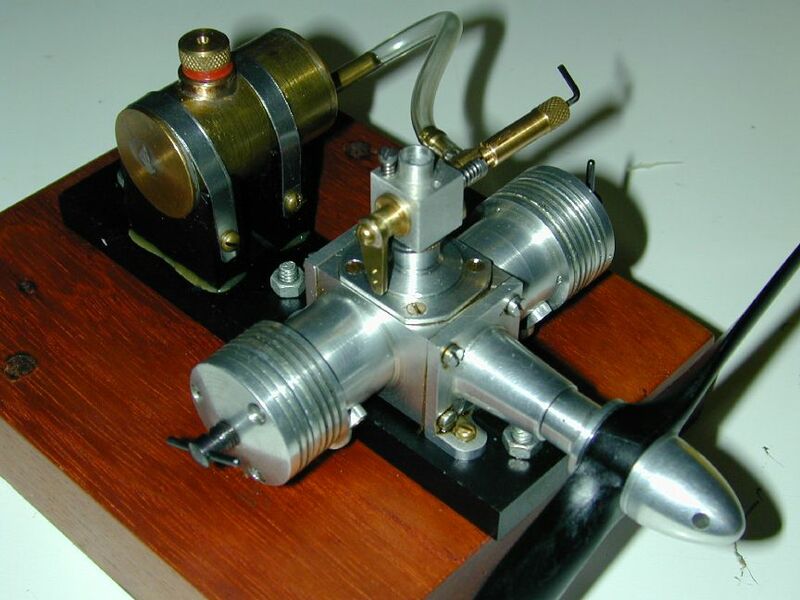 This Owen Mate 2cc diesel is the work of Australian MEN Member, Don Brymer. Don joined up in July 2009 and received his DVD which includes the MBI Plan Book in which are the plans for the Mate, amongst others. 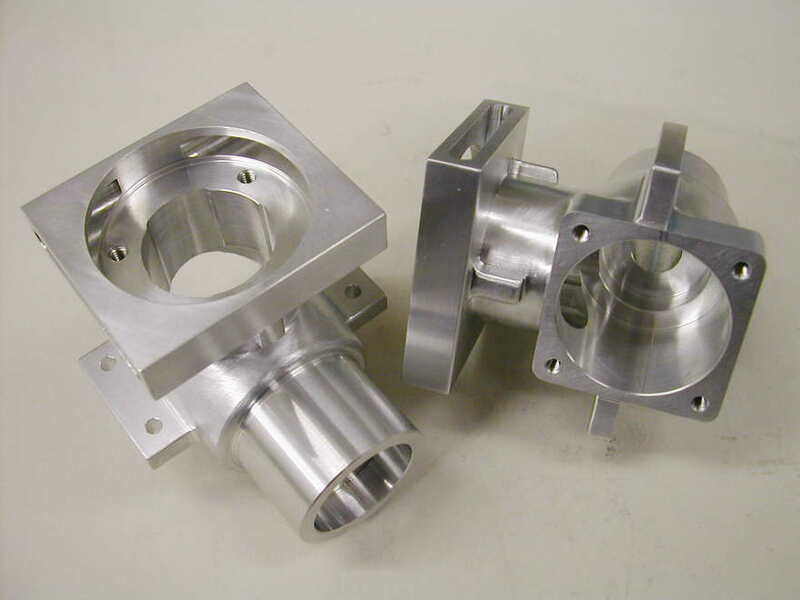 The original Mate case was an aluminium extrusion, but as those are long gone, Don demonstrated his skill at converting a lump of ally block into a twin of the extrusion (after a practice run) and estimates that construction took about 200 hours. Don reports that his engine now has about 20 minutes of running and starts easily. He's now thinking about the Fig Tree Pocket Twin diesel.